As one key element in its new “Live Consciously” brand platform, Panera Bread is launching a “Food Chain Reaction” social media campaign. The overall “Live Consciously” campaign, from Cramer-Krasselt, Chicago, eschews restaurants’ typical focus on product offerings, instead aiming to articulate Panera’s “purpose-driven” brand philosophy -- including how it does business, the kinds of cultural values it wants to reflect, and the impact it wants to have on society. The campaign -- which includes advertising on national cable and local television, radio, national print, outdoor and digital video and display ads as well as social -- is budgeted for approximately $70 million, about 30% higher than last year’s advertising spending, and the largest annual advertising investment in the company’s history. Its tagline -- “Live consciously. Eat deliciously.” -- ties the original mission defined by the company’s founder and current chairman and co-CEO, Ron Shaich, of “adding value to people’s lives” to the idea of “eating deliciously,” sums up Lisa Lorenz, director, brand marketing-creative content for Panera. “Instead of talking about what we do, the campaign talks about the how and why behind our practices,” Lorenz tells Marketing Daily. In addition to its commitment to fresh, local ingredients sourcing (and antibiotic-free chicken), the chain has long engaged in community-support practices, including donating its unsold baked goods every evening to local food banks. Through the Panera Bread Foundation, it’s also established Panera Cares Cafes – locations where people can order from the usual Panera menu and pay whatever they can afford (or nothing at all). The fifth café, in Boston, was opened in January. The others are in St. Louis, Detroit, Chicago and Portland, Ore. The campaign’s “Food Chain Reaction” social element builds on a partnership Panera began late last year with Feeding America, to enable Panera to donate food to Feeding America that is distributed by FA to food banks as needed within its national network, reports Lorenz. 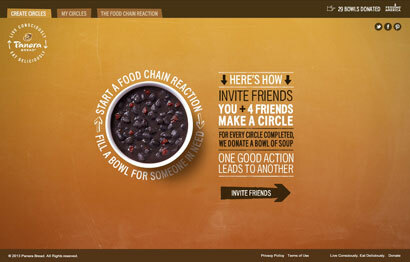 The social initiative’s premise: Panera’s socially conscious customers are being encouraged to join with others to create online circles of five friends on a Food Chain Reaction platform in Panera’s Facebook page. For every circle of five friends formed, Panera will work with its Foundation to provide a bowl of its Low-Fat Vegetarian Black Bean soup to a person in need through its alliance with Feeding America. The goal is to donate 500,000 bowls of soup by April 11 -- while also increasing awareness of America’s “food insecurity” crisis (one in six Americans don’t know where their next meal will be coming from, according to Feeding America). Like the overall campaign, the Food Chain Reaction employs the concept of a circle to convey that “one conscious choice leads to another,” ultimately changing lives for the better, says Lorenz. To drive awareness and participation in the donation program, Panera sent an advance email message on February 14 (the campaign launches formally on February 18) to the 9 million of its total 13 million My Panera loyalty program participants who have opted in to receive communications from the brand. Beyond that, while a few of its paid digital ads will mention the Food Chain Reaction program, Panera will rely mainly on its social messaging (and a video about the program) and sharing about the program among its more than 1.5 million highly engaged Facebook fans, more than 88,000 Twitter followers, more than 6,000 Pinterest followers and other social word-of-mouth, according to Lorenz.